I’D just spent far too much of my Saturday cleaning out Jemima the Hamster’s two stinky cages when a load of heavy books landed on me. I was not impressed. Closer inspection of the large bookcase in the boys’ room showed they’d wrecked it – mostly by shoving oversized books horizontally on top of already overstuffed, now broken shelves. It was like a precarious book-based giant game of Jenga. 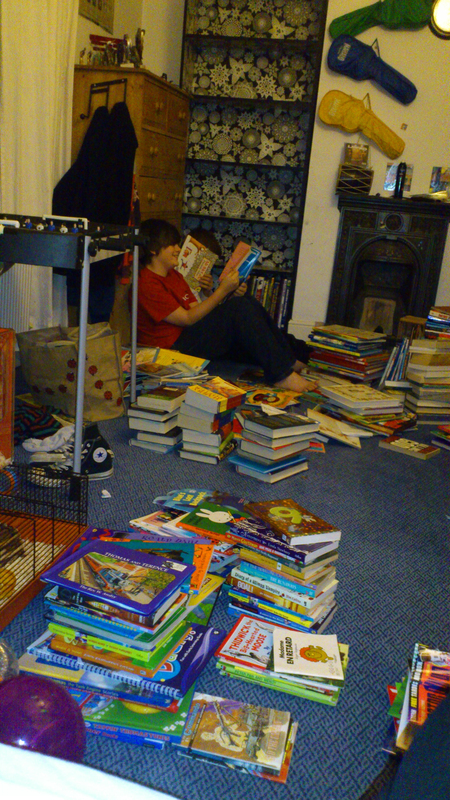 Needless to say, the elder boys and I spent far too much of Sunday trying to fix the shelves and sort the books. It was way overdue. We hadn’t got rid of any books for 14 years and yet they rarely returned to any of them once they got past the bedtime story age. But once they started sorting, I could sense they weren’t going to give them up easily. Rather than sorting them into piles – charity shop, recycling and back-in-the-bookcase – they both settled down and started to read. They might be barely into their teens but the room stank of nostalgia: “Aw, do you remember this one?” “Ah, there’s my ‘Where the Wild Things Are.” “No, it’s not yours, that was bought for me, I remember being read it. . . look, here’s where I ripped it. . .” and so on. At one point the entire family was in the room, either having a long-forgotten bedtime story read to them, fighting over an out-of-date football annual or simply trying to sneak some of the tattier, drawn-in volumes out to the bin. So I’ve inadvertently come across a way to get your children interested in reading: tip the contents of a small library all over their bedroom floor and then threaten to chuck it all out again. Which reminds me, I think there may have been overdue library books in those piles somewhere . . .
POOR little Bonnie. She’s been left out of all the back-to-school excitement and now has a raging cold which has left her with a sore nose and grumpy disposition. Being the two-year-old with three older, male siblings doesn’t usually mean she’s left out. She’s often the centre of the boys’ universe and they let her get away with far more than they do with each other. However, the boys have been getting their bags, pencil cases and uniform ready for school and she’s been desperate to join in. 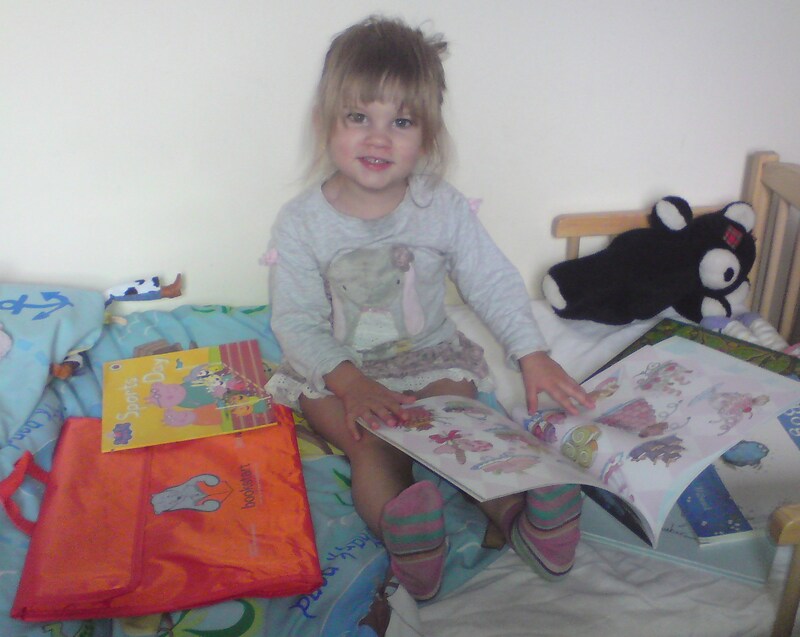 Good timing then, that she had her two-year check with the health visitors, and was given her very own Bookstart bookbag. Just like the one she tries to steal from Billy, only bright red instead of blue. Bookstart is an amazing scheme, probably taken for granted by us parents but much loved by the children. It’s the only national free books for all scheme in the world and sees parents given books to share with their babies and toddlers. It’s not purely philanthropic. It came about after academic research proved that children who read with their parents start school with higher attainment and a desire to learn. It was confirmation of funding by the former chancellor, ol’ Brown bear himself, which allowed the scheme to continue to provide free books to children, regardless of income or background. Book publishers and charity arms of companies also contribute. Bonnie loves books. She’s thankfully over the page-ripping stage, and will sit and ‘read’ aloud to herself if she can’t persuade someone to read to her. Favourites are the Mr McGee books beloved of her brothers, anything with Peppa Pig, and stories which involve pants or rude noises as part of of the plot. The Bookstart bag also had a couple of number posters to go on her wall, which reminded me how neglected the poor girl has been in terms of room adornment. 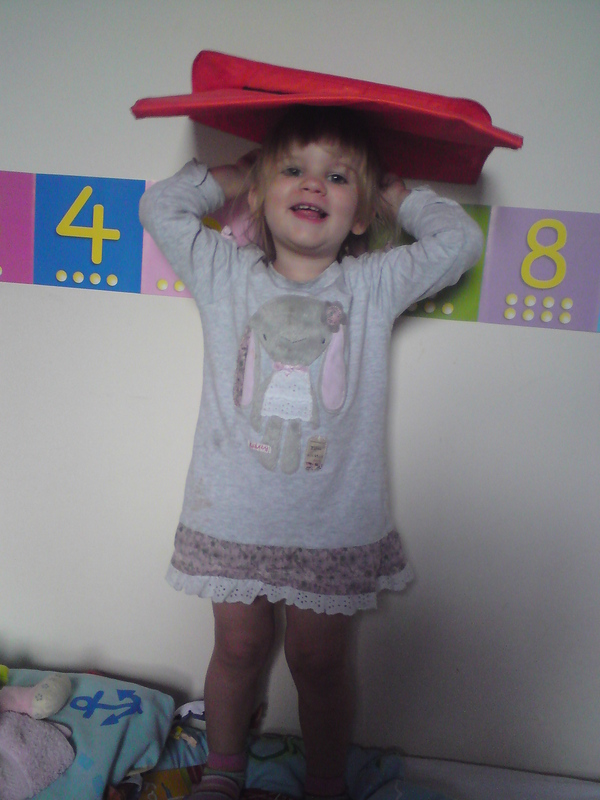 Her bedroom is still referred to as ‘the spare room’ and has no personalisation other than her mini-bed and toy box. So we put up the number posters and moved in some of the more babyish pictures from the boys’ shared room. She’s delighted, and Billy now has even more room to stick up the trillions of pages he rips from football magazines. Everyone’s happy. The baby Bookstart pack is the one you get before a baby’s first birthday and comes in a canvas bag with two board books and a mat. Then there’s a toddler one like Bonnie’s, and at three to four years they get a cardboard book chest with story books, coloured pencils and a drawing book. You get them from the health visitor and it encourages you to take your children to your local library, who also stock the bags. We do occasionally go to the library but it’s usually only once every couple of months. We went much more when there were fewer of us! It’s a resource every parent should use as there’s so much to do, for free. Getting your children used to being in a library means they’ll continue to use it as they grow up. But as with everything that’s state funded, if we don’t use libraries, it will be a source of great knowledge and happiness that may not be available for future generations.